If you're looking for the "Grow Your Blog" giveaway, go here to comment and enter the giveaway. I finally have all the blocks for my Celtic Solstice Mystery from Bonnie Hunter completed. I love how the secondary pattern emerges when they are hung on the design wall! I thought about changing the border so the points of the blocks continue into the border, but decided that would take too much calculating. 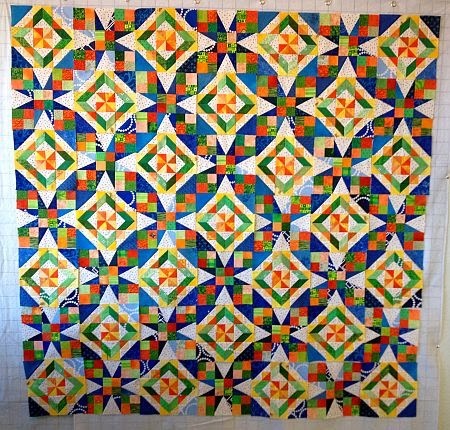 I have four rows put together, so I should be able to finish the top next Sunday. Tomorrow is Block of the Month day -- should I fix the borders in my January UFO, or make the last block of my Twisted Amish quilt? What a gorgeous quilt that's going to be! I vote UFO project! Your quilt is spectacular! I see what you mean about the secondary design showing from a distance. I love the Solstice!!!! Very nice. I vote for the Twisted Amish. This quilt is a stunner! Great job on colors and piecing. What a great looking quilt. The colours are very tropical looking to me. I understand "tired of a project, " especially a many pieces Bonnie Hunter project. But finishing the points would make a stunning quilt that much more elegant. I agree with Scrapatches--the one you feel like. If you don't feel like either, then draw straws. I'd go with fixing the borders first--get the top out of the way & ready to be finished! Then, finish the Amish quilt.